Kenny and I just returned from a 10-day (Feb. 22 - Mar. 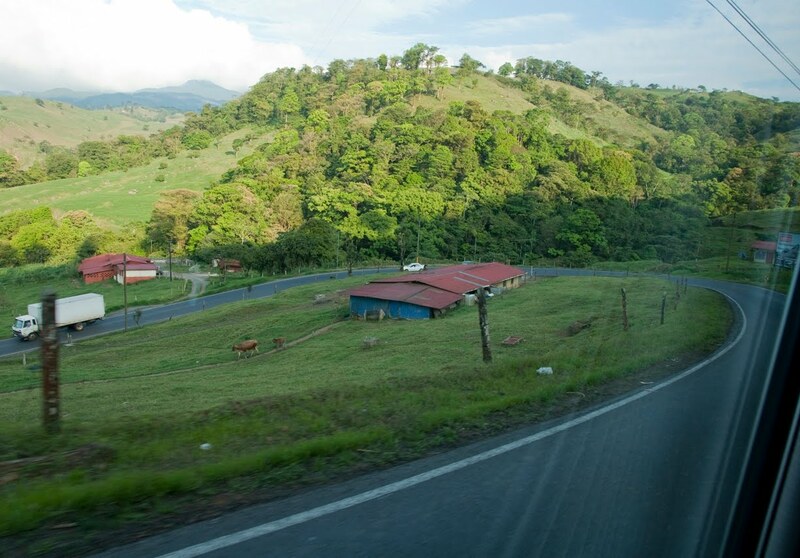 3) photography tour of Costa Rica. It was a wonderful trip and we made lots of new friends. 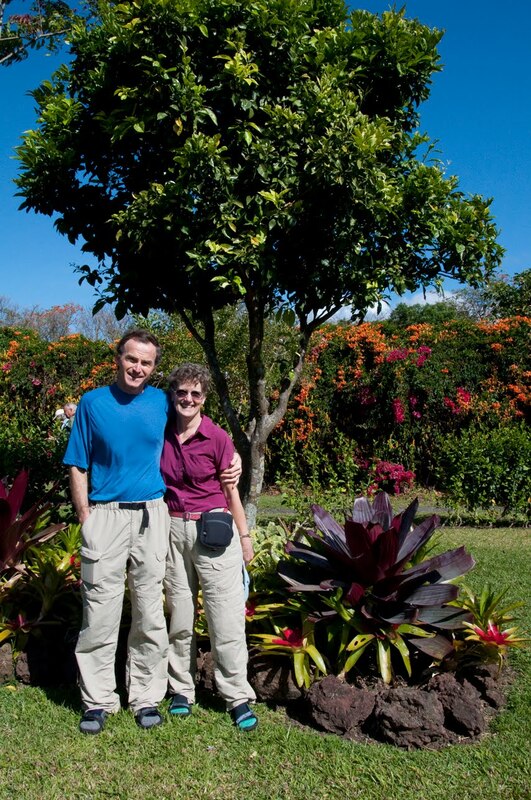 It was led by Tom and Pat Cory of Chattanooga through Strabo International Tours (out o f NY) and Horizontes Tours of Costa Rica. Other participants were from Alabama, Pennsylvania and New York. Kenny is not in this photo because he took it. Willy, our Costa Rican guide / naturalist / photography expert (far right in the photo) was fabulous. I was thrilled that he knew a lot about the plants and animals! We were at the Selvatura Hanging Bridges of the Monteverde Cloud Forest in this photo. I had to laugh when I saw the funny Bougainvillea flower (upper left) at our hotel in Monteverde, it looked like a cartoon character! We began our trip in San Jose where we stayed at the fabulous Bougainvillea hotel with beautiful gardens. I've never seen so many orchids, heliconias, passionflowers, bromeli ads, hibiscus and many other tropical flowers in one location! I was in "Flower Heaven"! 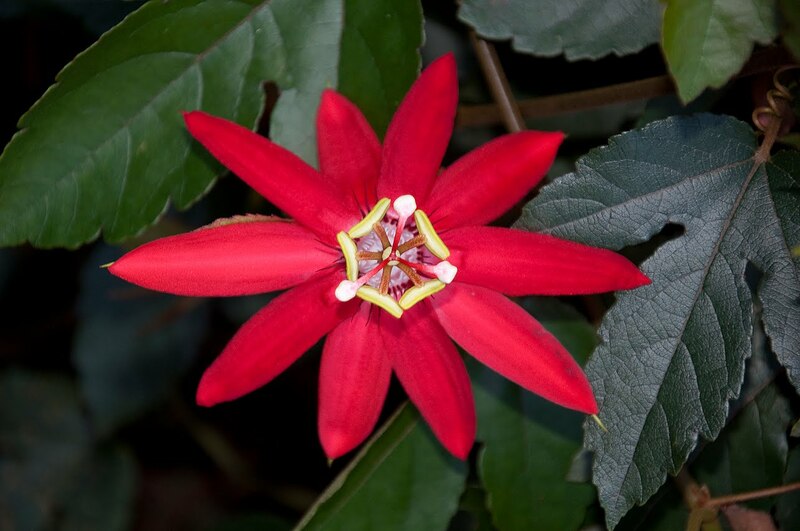 I was delighted to see the spectacular Crimson Passion Flower vine in bloom. In fact, I got to walk through a couple of tunnels made up of those vines! It was one of my "target plants". The fence surrounding the property was covered with brilliant pink Bougainvillea and orange-flowered Flame Vines. 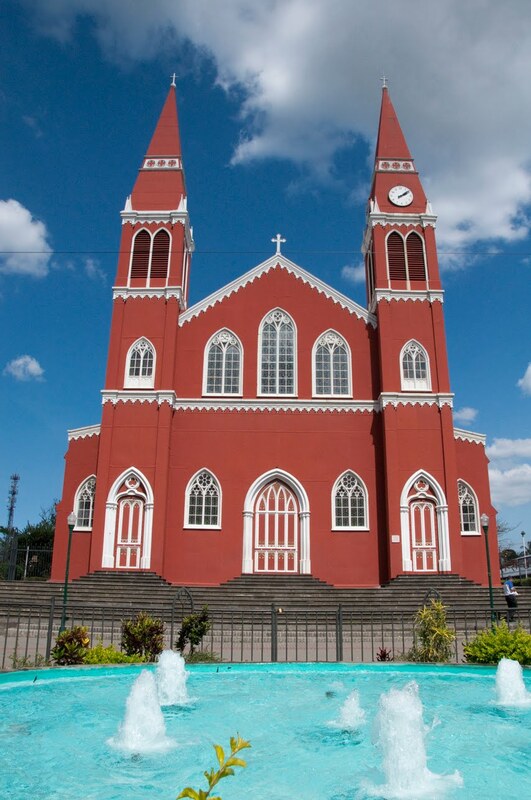 On the drive north to Arenal we stopped at a few little towns, incl uding Grecia, where we saw this beautiful, brick-red Catholic church. We stopped for a while to photograph it inside and out. We also stopped at a large souvenir shop in the town of Sarchi. It had some nice wooden ware and hand-stitched T-shirts made by the local Indians. The roads got pretty steep, curvy and narrow as we went farther up into the mountains. There are no shoulders and in some cases no lane lines. 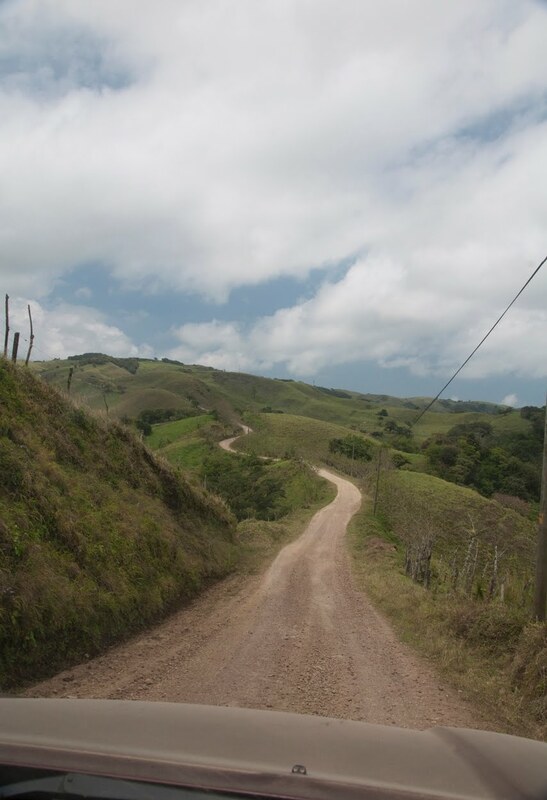 We learned a few days later that these are some of the really GOOD roads in the mountainous areas of the country! At least these were paved!!! 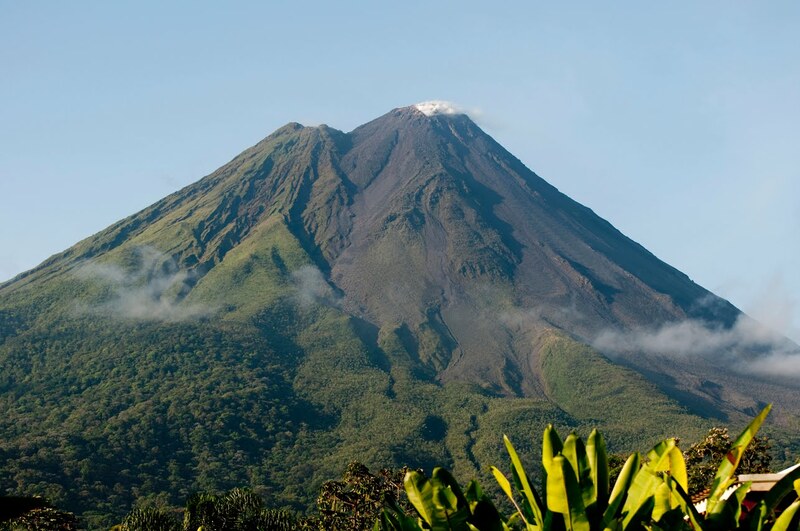 Our second and third nights were spent in the town of La Fortuna, at the eastern side of Ar enal Volcano. We were thrilled to have a beautiful, clear view of the volcano the morning we left, the chances of seeing it are 1 out of 3. 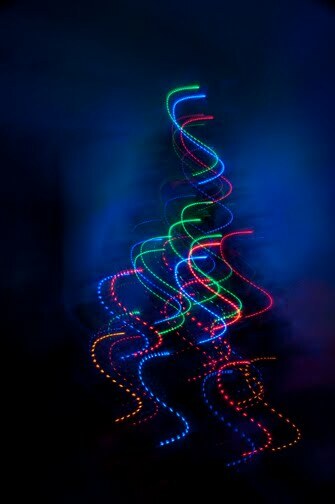 It is an active volcano that sometimes erupts, throwing glowing rocks from the vent at the peak. We only saw steam and gases spewing from the top, but we were excited about that. The room Kenny and I stayed in had a great view of the volcano. 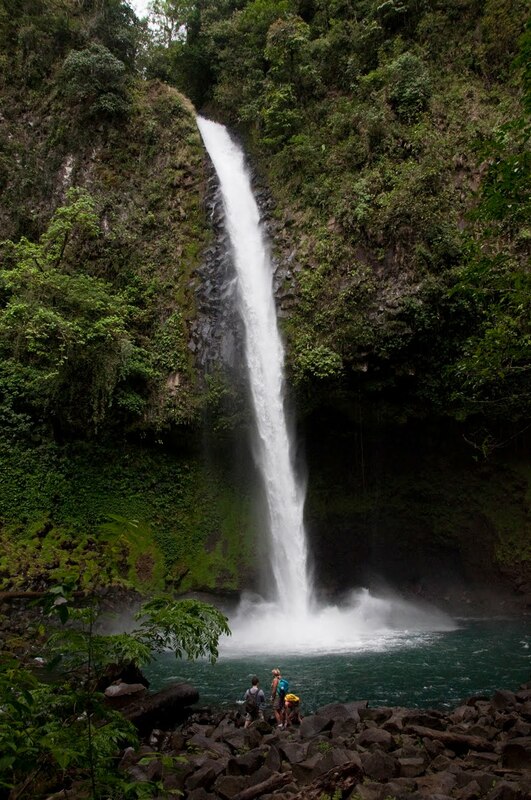 La Fortuna is also home of the Catarata La Fortuna, a thin 70-meter waterfall that plunges out of the cloud forests. The hike involves 660 steps down a very steep trail to get to the bottom, and of course, just as many exhausting steps back up! 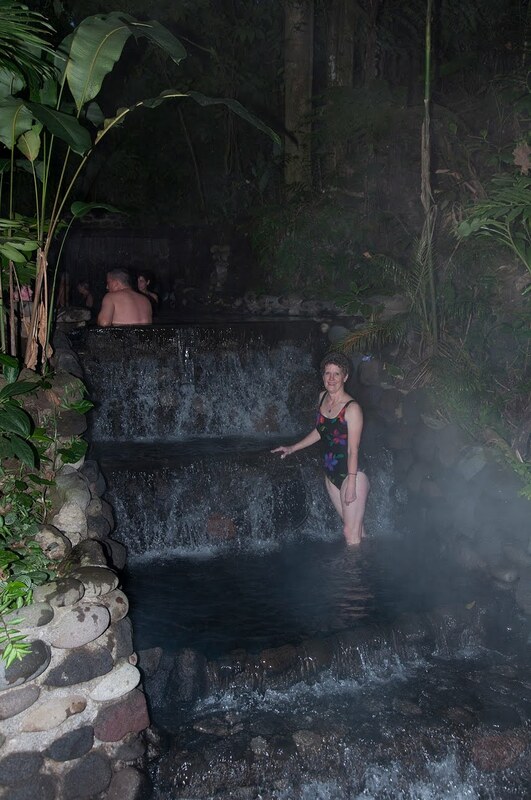 There a re several hot springs in the area that are heated by the volcano, one evening we visited one and enjoyed a nice warm soak. It felt very good to those of us who hiked to the bottom of La Fortuna Falls. We enjoyed listening to howler monkeys as we floated in the pools. It was getting too dark to get a good look at them. We also enjoyed a visit to the Ecocentro Danaus, a wonderful little nature preserve run by an indigenous Indian tribe. They had reclaimed fa rm land and let it grow back to forest. The plants grow so quickly there, it had taken only about 10 years to revert back. One of the highlights of that visit was seeing the fabulous birds at the feeder! I never knew so many birds like bananas! 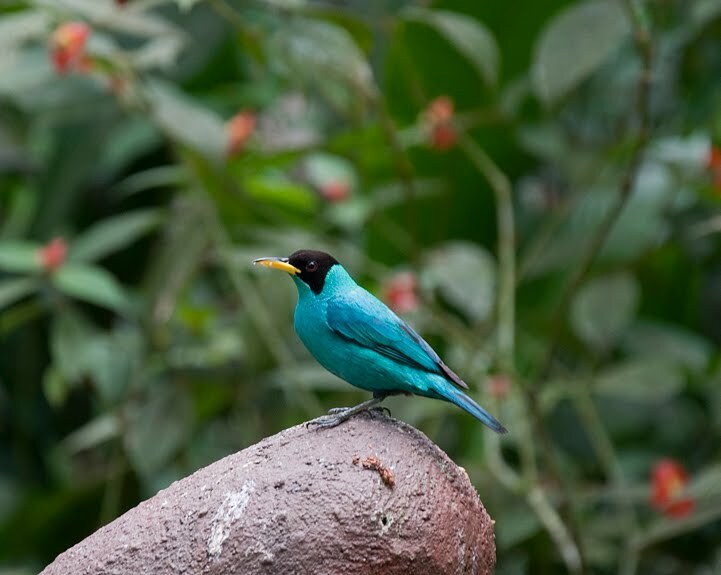 This jaw-dropping male Green Honeycreeper had 10 photographers snapping their shutters like crazy! We also saw an agouti (a big rodent that looks like a long-legged guinea pig), a couple of Basilisk lizards, glimpsed a couple of sloths, and butterflies in a small enclosure. The people sold interesting painted masks and animals carved from gourds and balsa wood. One of the fellows taught me how to say "thank you" in his language - "Capi capi". 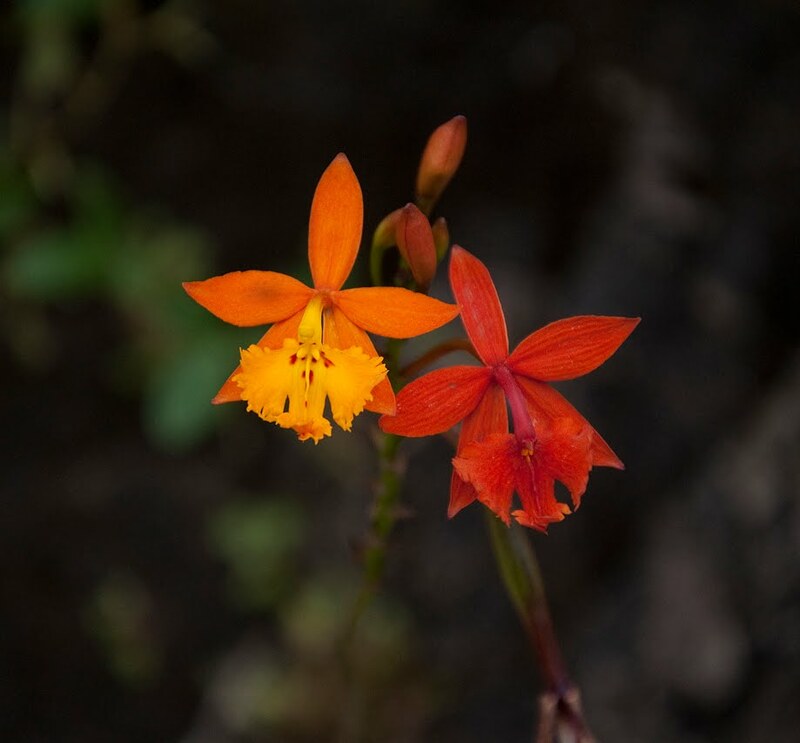 The Montever de Cloud forest is quite a jewel in Costa Rica's ecological crown! We got to see many kinds of beautiful birds such as the (L-R) Blue-crowned Motmot, Purple-throated Mountain Gem Hummingbird, Magenta-throated Hummingbird, male Green Honeycreeper, and the Orange-throated Trogon. At Selvatura, we enjoyed photographing many species of hummingbirds and butterflies. We even got to catch a Blue Morpho butterfly with its wings open, they can be very difficult to photograph. 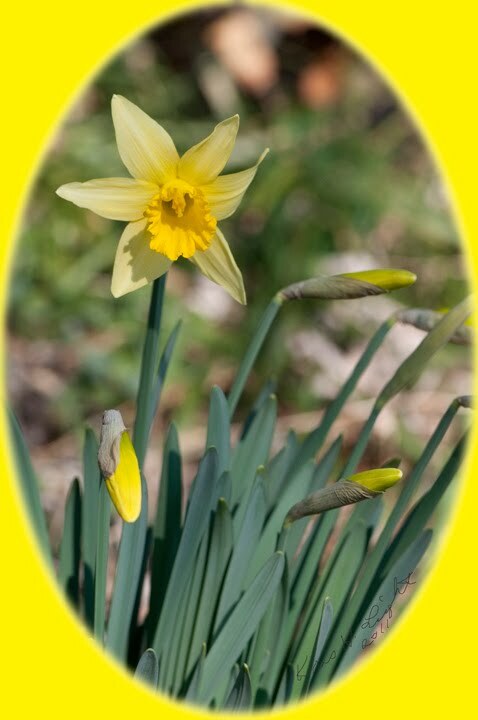 Spring is not far off now! Having flowers in my yard helps me survive the winter! 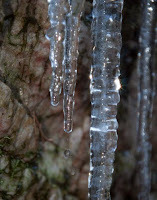 However, I know not to get too excited, we nearly always have a few more cold snaps before spring offically arrives. 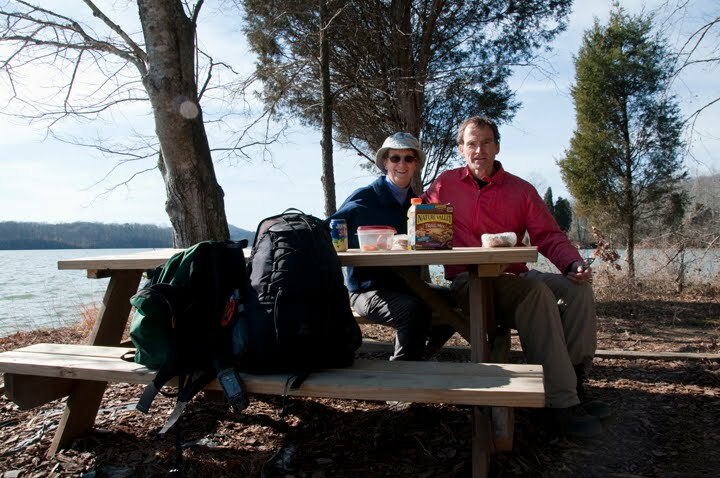 Kenny and I hiked at Haw Ridge last weekend, the weather was so nice, we had to get out and enjoy it. We decided to hike our usual route "backwards", starting up by the Dragonfly Pond. We took a different trail than we expected, and to our surprise we saw a ghost!!! 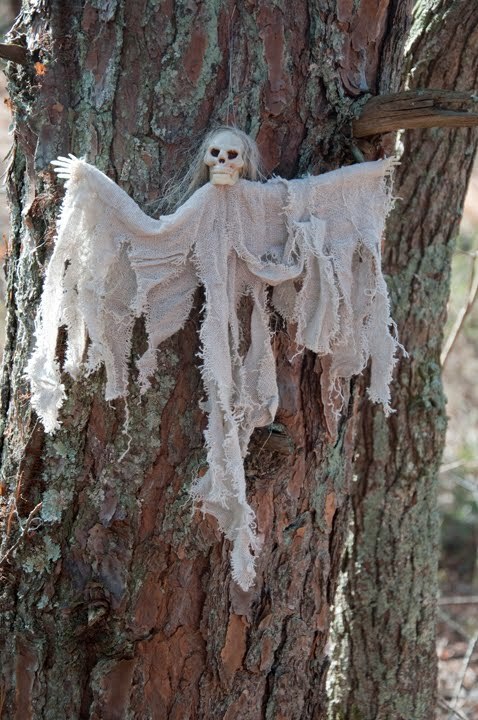 :) The Friends of Haw Ridge often sponsor a "Haunted Trail" at Halloween, this ghoul was left over from one of those events. It gave us a good laugh! We stopped at the picnic tables to eat our lunch. I set the camera on the second table and snapped a photo of us with the self-timer. Kenny and I had last Friday off from work. 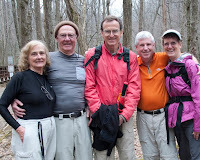 Our friend, Bob (in orange shirt), from the Souther n App alachian Nature Photographers (SANP) invited us to go hiking with him and some friends, George and Ann, in the Smokies. We went on the Middle Prong trail at the end of Tremont Road. 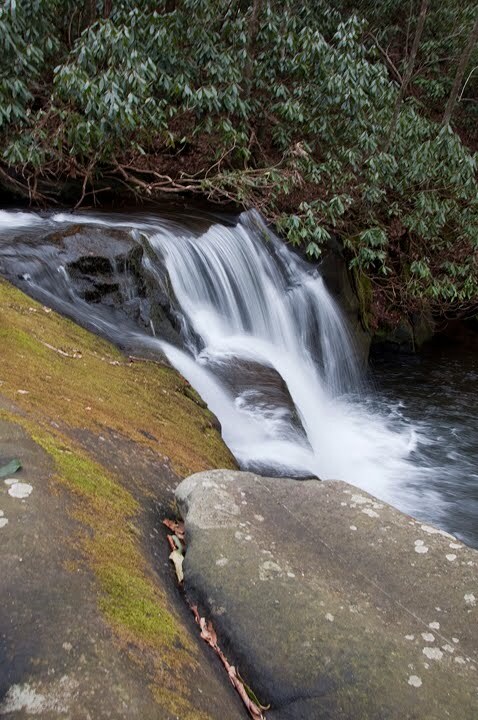 The trail has some very lovely cascades and waterfalls. 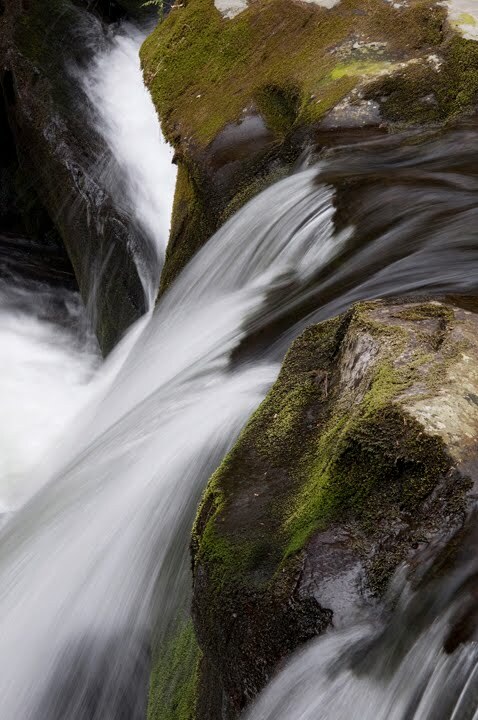 I love taking photos of running water. 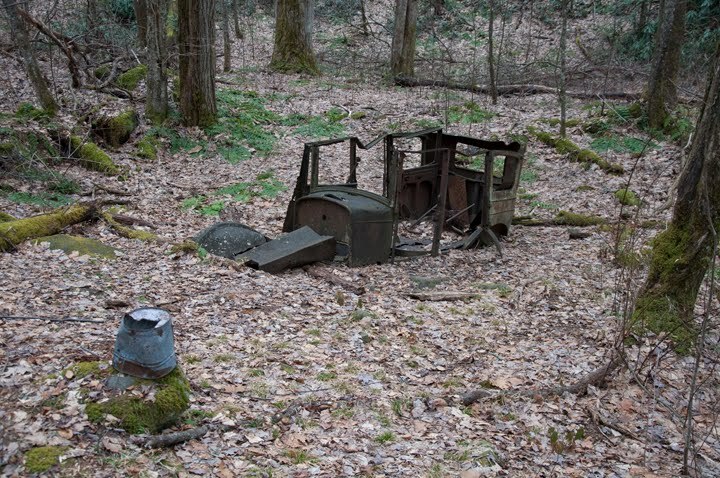 Along the trail we also stopped to see the remains of an old Cadillac left behind f rom the logging days of the last century. 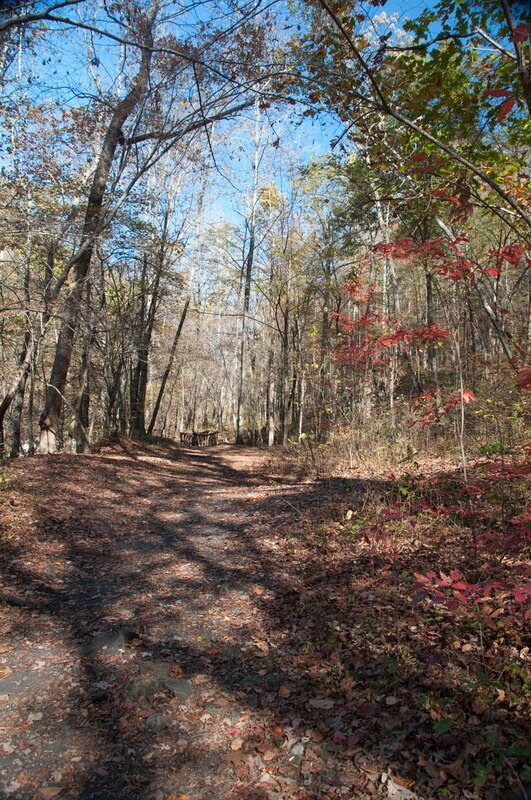 The Middle Prong trail follows an old railroad bed, it is an easy trail to hike. Farther up the trail we took a side hike to go see Indian Flats Falls. It was the first time Kenny and I had seen it. We were surprised to see remnants of snow and ice on the trail! It made getting to the falls a bi t tricky! There is an upper part of the falls and a lower part. I slipped on the algae on the rocks above the lower falls and was glad I didn't take an unexpected "swim" in the creek! I'm looking forward to going back up there in a few weeks so I can get some springtime photos! Yellow Crocus and warbler rump! 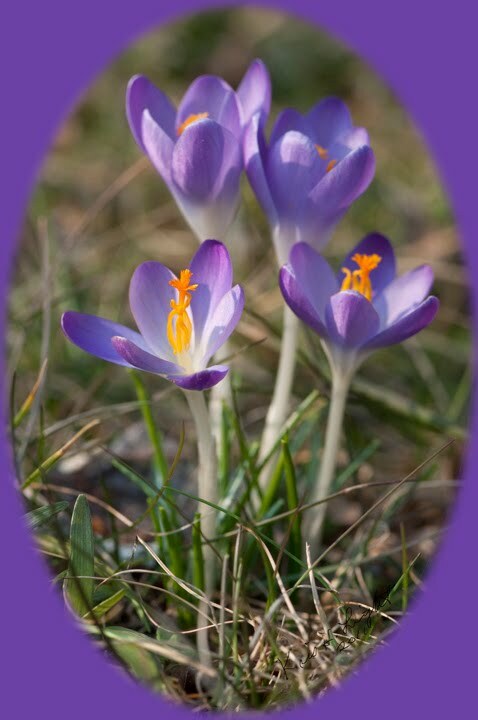 I'd been waiting to see when my first crocus would bloom this winter. 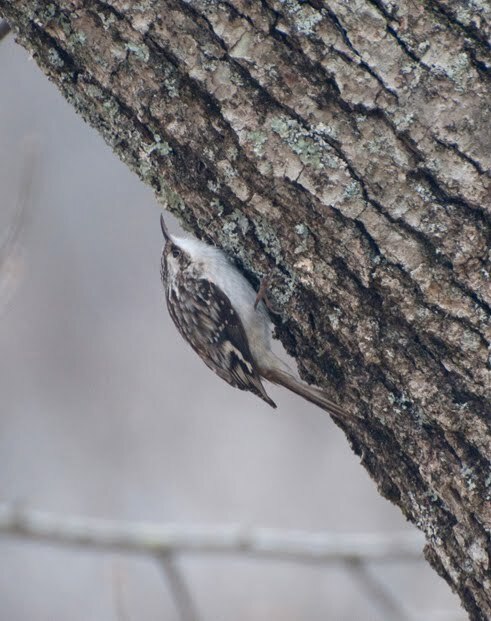 The cold weather really slowed them down. 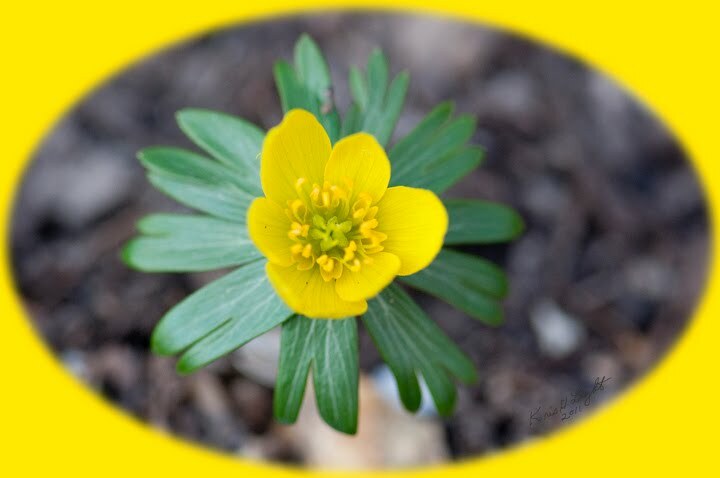 I finally saw a single yellow snow crocus in the front yard on Jan. 26. Today I found this nice clump blooming near the mailbox. 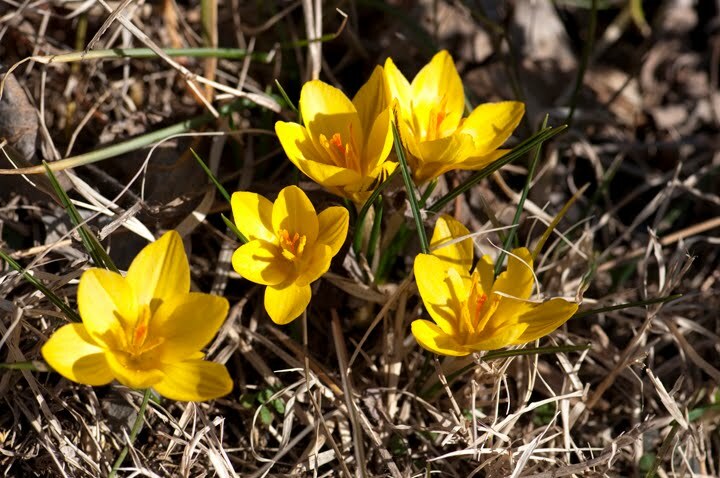 I have planted crocus bulbs in the yard for nearly 30 years, they are always such a pleasure to see each winter. 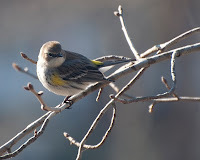 This morning I enjoyed seeing a pair of Yellow-rumped Warblers visiting the suet feeder. They may be small, but they don't put up with other birds! 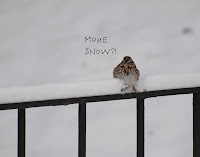 We awoke to 3" of pretty, fluffy snow this morning! As soon as it got light enough I went out on the carport to take some snowflake photos. 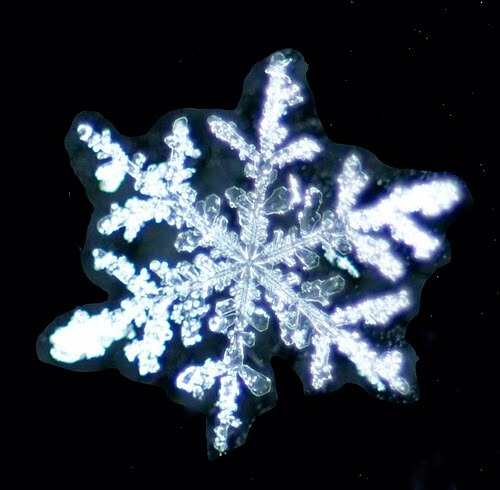 There were som HUGE dendrites (~5mm) but I noticed the y looked thick and white. When I zoomed in on them with my macro lens I could see why. They had tiny balls of ice (frozen cloud droplets) encrusted on them. 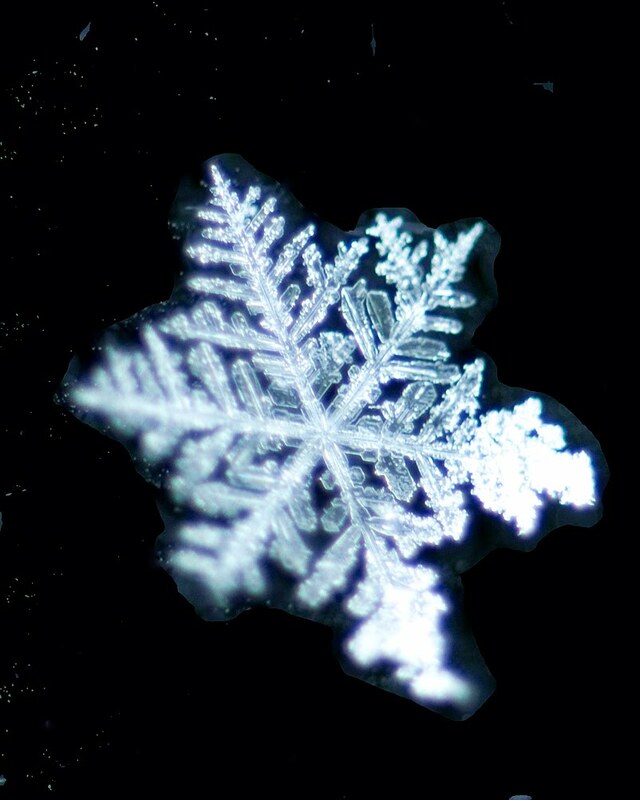 Notice how this snowflake (left) has 2 "arms" that are white, those are the ice balls. The snowflake on the right has even more of the rime ice, they look like microscopic peas. 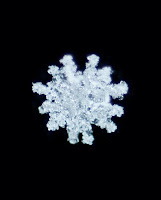 The big thrill of the morning though was catching and photographing the double snowflake! It has 12 points. 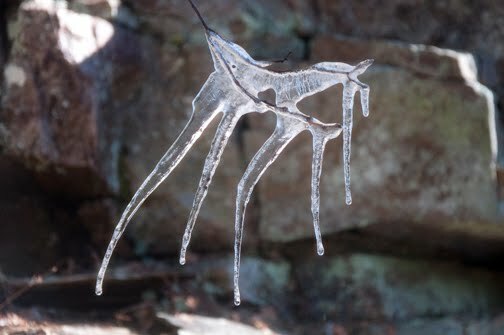 I just wish it had not had all the little ice balls on it! Picky, picky! 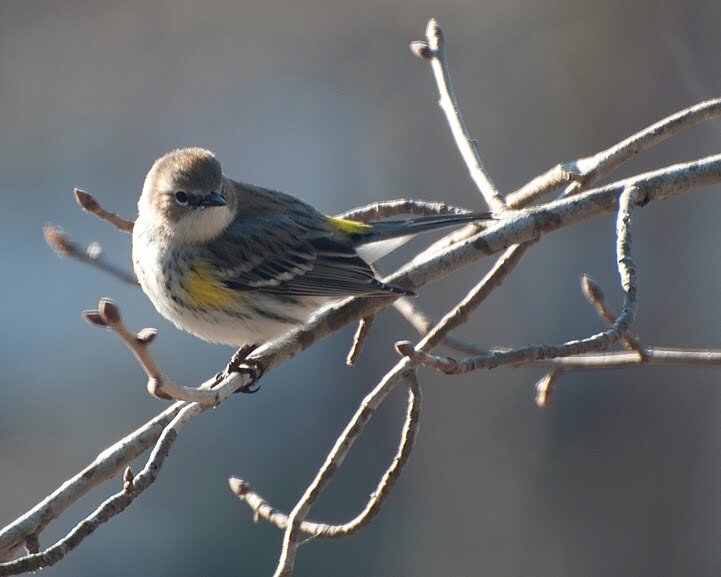 It was a good day to photograph the birds t oo. 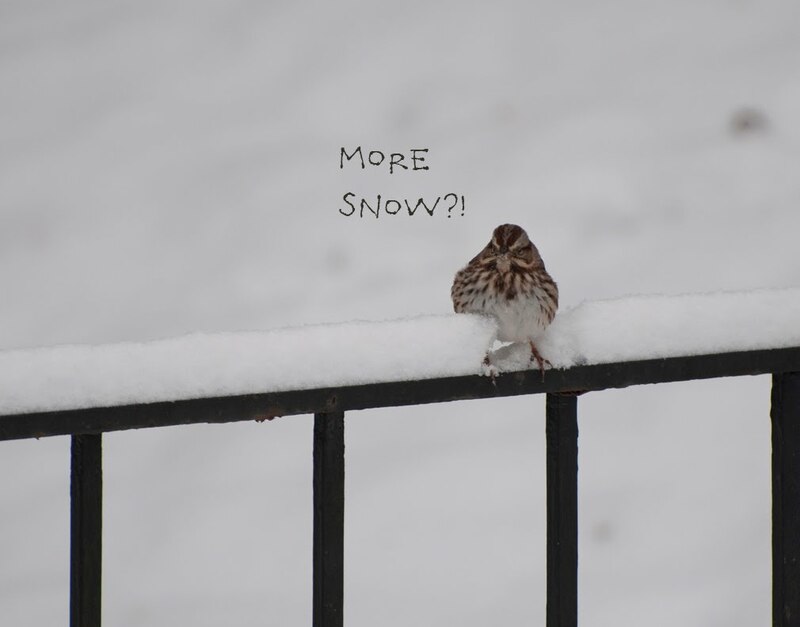 I got a kick out of this angry-looking little Song Sparrow sitting on the patio railing up to his chest in snow. I couldn't resist adding this caption! 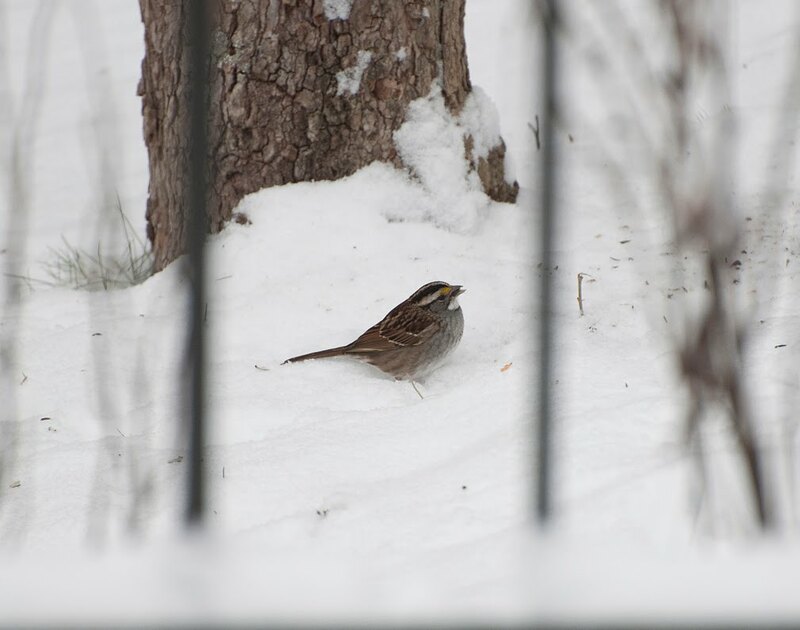 :) Other birds included this White-throated Sparrow I shot through the patio railing. We spent three days in Milton, FL visiting my parents. Unfortunately, we missed the first white Christmas that Oak Ridge has had since the early 1990's! Grrrr! :( It was wonderful to get to spend time with my folks though! 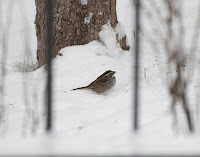 I have been excited to see a couple of uncommon birds (to me, at least). A little Brown Creeper came to the tree behind the house yesterday. I had seen one a few years ago, but couldn't get a good photo of it. Fortunately, this one stuck around long enough for me to put my telephoto lens on my camera and get a few shots. 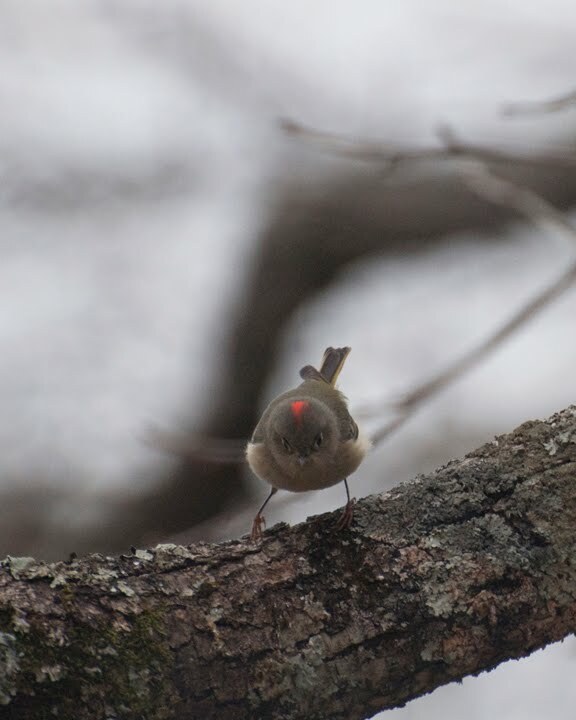 The other bird was a pretty little Ruby-crowned Kinglet, it was the first time I had seen this bird. 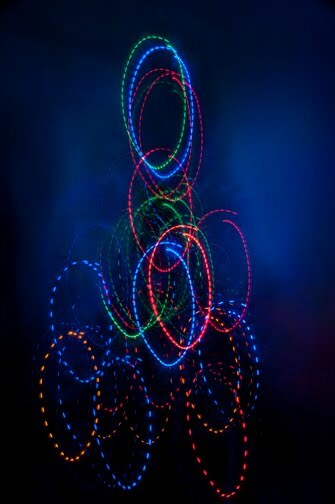 I managed to get only one shot before it took off, it is a pretty crazy photo! Happy New Year to my blog readers! 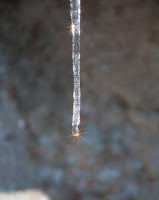 Have a wonderful, nature-filled 2011! Oh boy, I am SO behind on my blogging! Although we have done some hikes lately, I just haven't posted them. 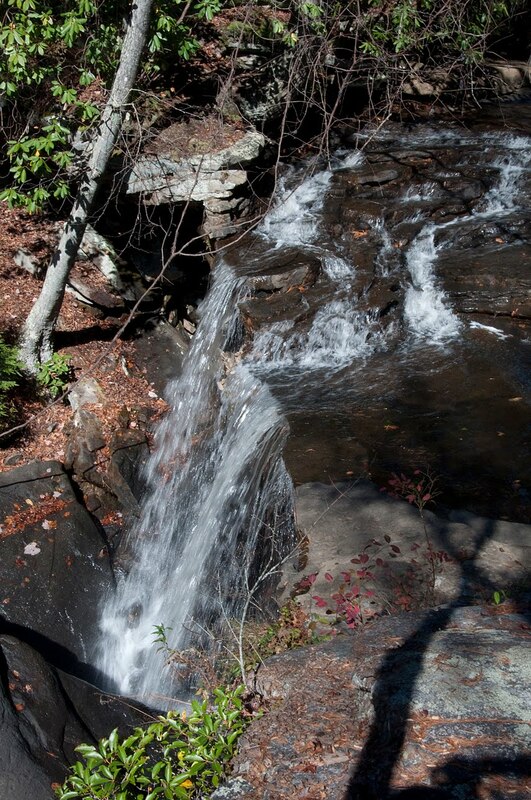 Today we went to Spring City and hiked to Piney Falls. We were delighted that the Dept. of Conservation acted on my information about the off-road vehicle drivers that had cut trails through the woods. 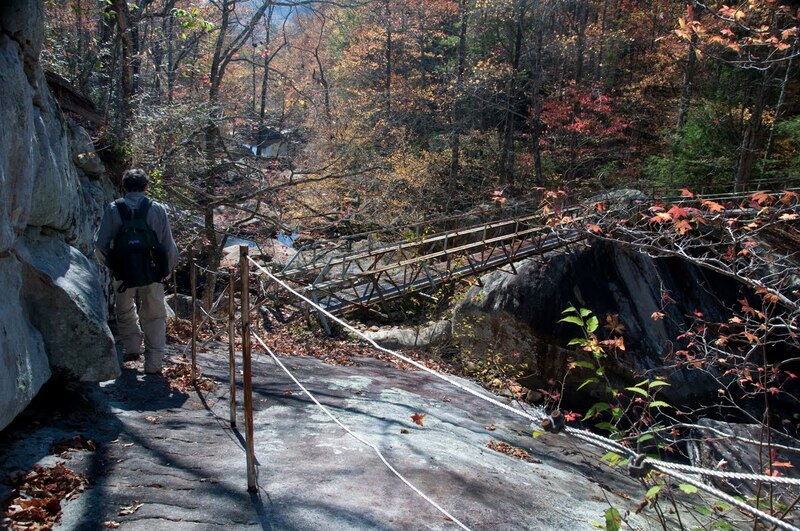 There were huge boulders and iron pipe gates placed across the trail entrances. So, I guess the squeaky wheel DOES get the grease! :) It was so nice to walk on a smooth trail that wasn't eroded with huge ruts. There wasn't any trash along the trail from redneck parties either! 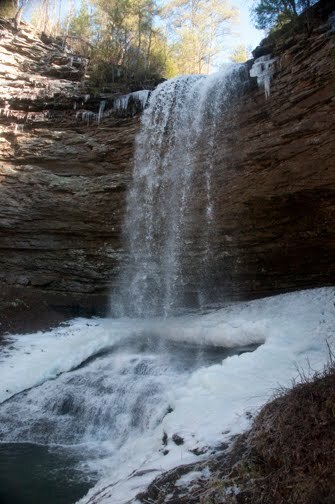 The waterfall was partially frozen on the sides, it has been above freezing the past couple of days. We were unable to go very far down to the bank or behind the falls due to all the ice on the rocks. I took a p retty bad fall there last year and didn't want to repeat that! The ice at the bottom was very thick. I had forgotten to take my starlight filter off my camera before the hike, so it made an interesting effect when I photographed this icicle in the sunl ight. 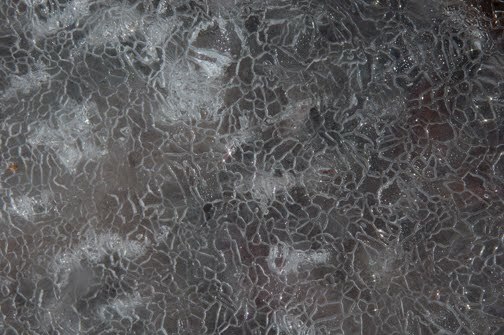 Ice can form some fascinating patterns. I liked the designs in this piece. 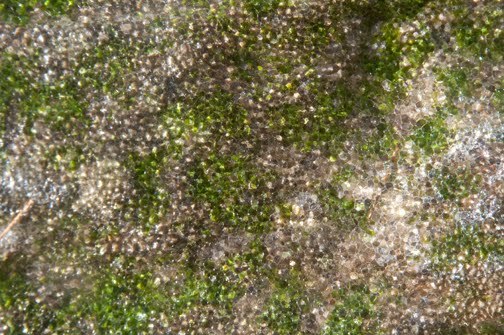 One moss and lichen-covered boulder had interesting patterns where the snow had partially melted then refroze into little clear pellets. When there aren't any wildflowers, birds or insects to photograph, I have to find something! I'm a week behind on this! It has been a busy week! Last Sunday Kenny and I decided to take advantage of the beautiful fall weather and go hiking. 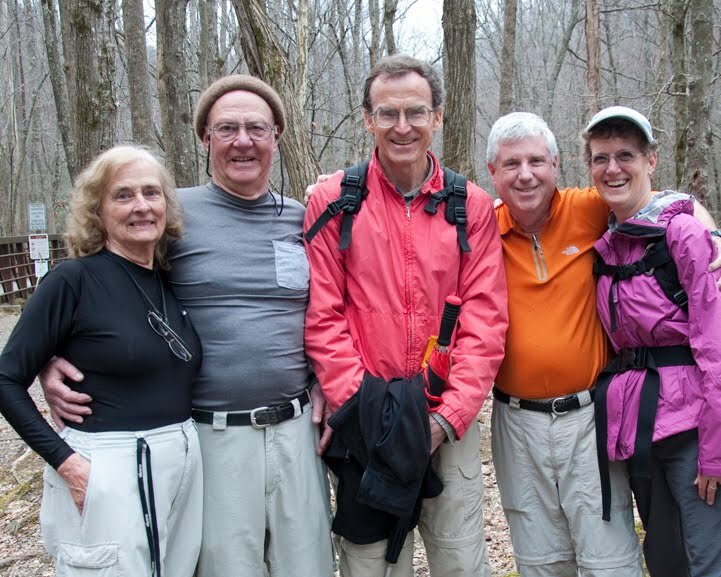 We drove south and went to the Laurel - Snow Pocket Wilderness, one of Tennessee's State Natural Areas near Dayton, TN. 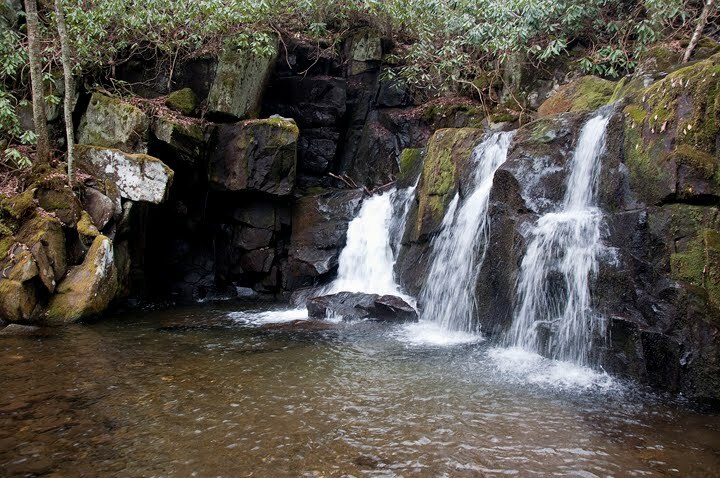 Since we had hiked up to Laurel Falls many times, we decided to go to Snow Falls. 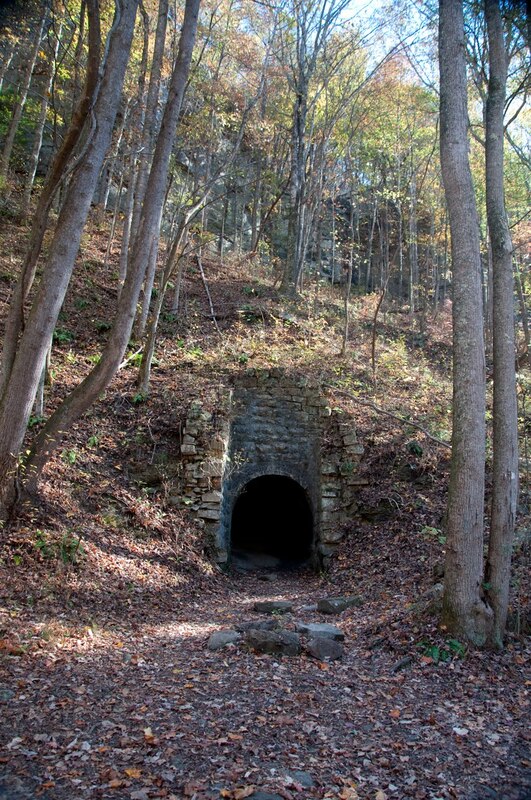 The beginning of the trail from the parking lot follows an old railroad bed that was used to remove coal dug from the small mines in the hillside. I'm surprised the mine entrance (right) has not been blocked by the state, old mines are very dangerous. 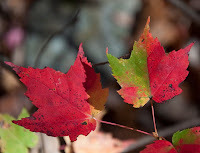 We saw some pretty fall co lors along the way, including these Red Maple leaves. I liked this half-red, half-green leaf! One thing I saw along the trail really irr itated me, I HATE it when inconsiderate people spray paint graffitti on anything, but ESPECIALLY on the beautiful rocks along the trails! 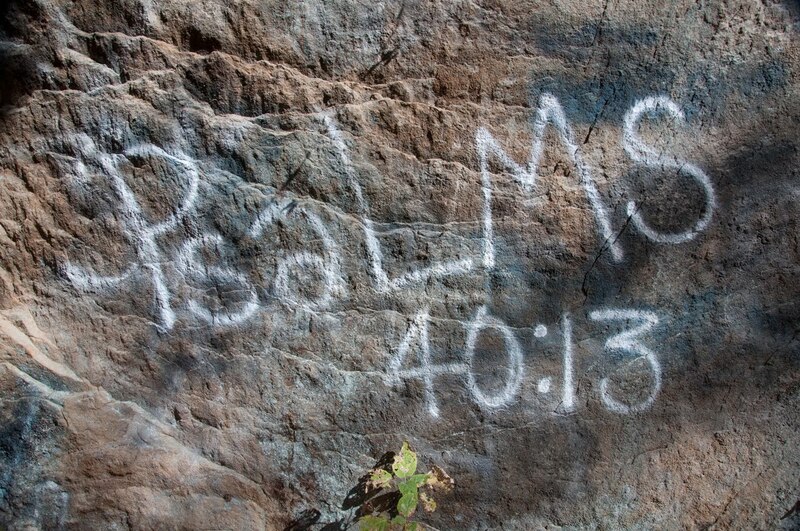 I wonder how the person who vandalized this cliff with religious graffitti would feel if someone came into his or her church and wrote environmental messages on the walls!? I hope it wasn't a student from nearby Bryan College in Dayton (from the Stokes Monkey Trial fame), they should know better! Parts of the trail are very rocky. There are some of the biggest boulders in the creek that I have ever seen, some are the size of a small house! I turned on the camera as we walked over one rocky part of the trail. 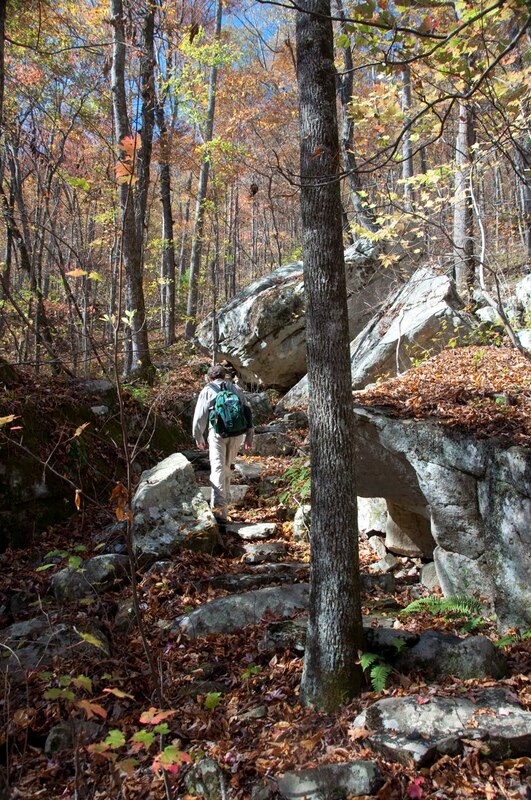 I didn't realize how much noise I make when I walk through the leaves and over the rocks, I sound like a pack horse! 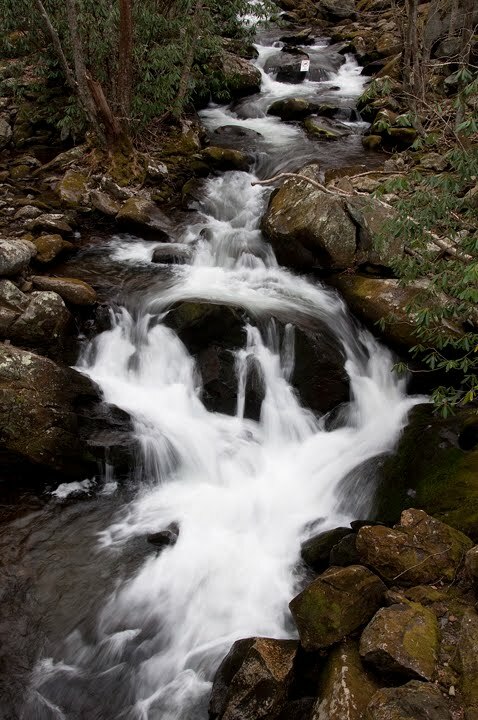 The trail to Snow Falls eventually crosses the creek by way of a 150-ft. bridge over some of those huge boulders. The first boulder has posts with cables and grooves cut into the rock to make walking on it a bit safer. 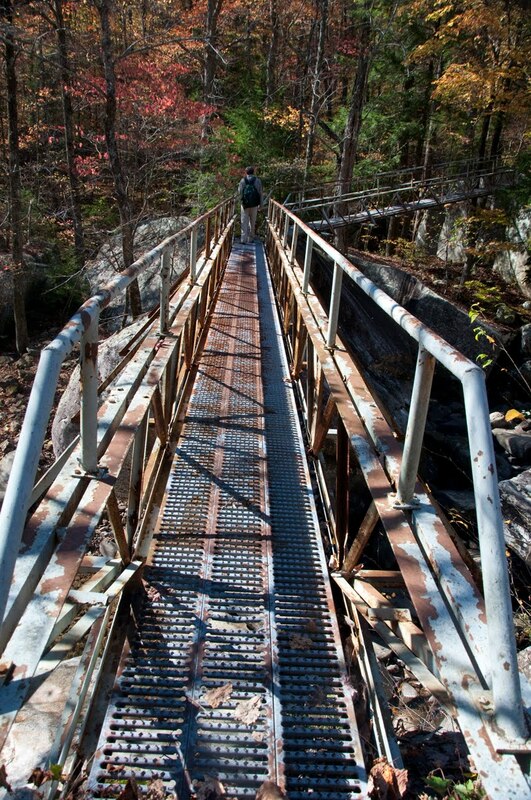 I'd love to know how the trail crews got those long pieces of railing back there! From this point, the trail took a steep turn up the sid e of the gorge. 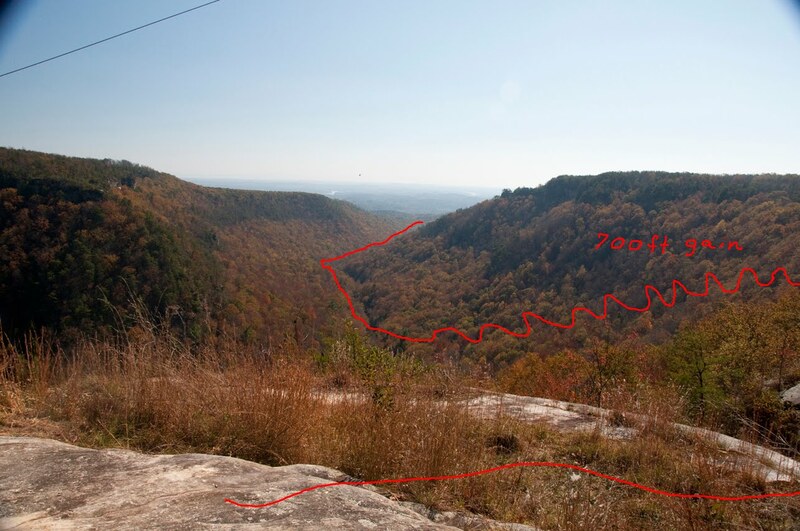 It was approximately 1 mile of 8 switchbacks to gain 700 feet in elevation ! As we hiked along the trail Kenny suddenly stopped and motioned for me to come up to him quietly. 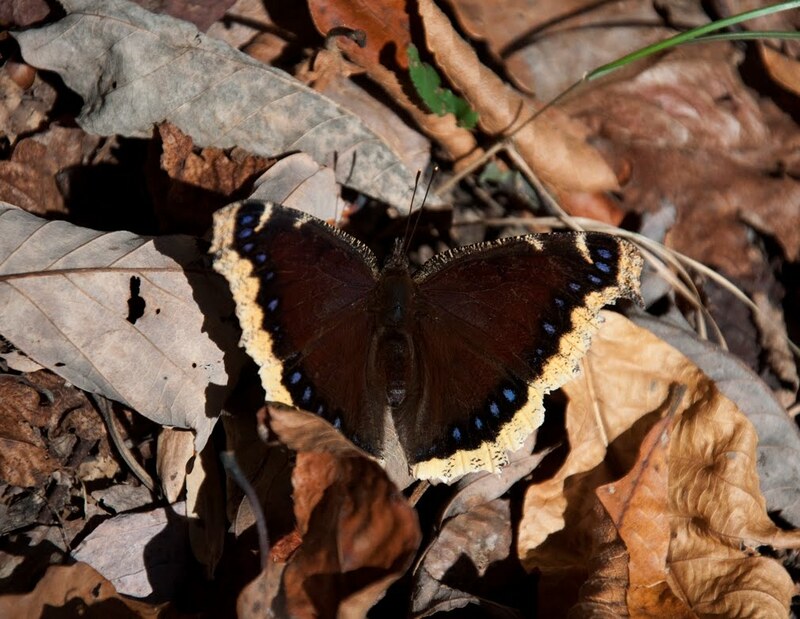 At first I couldn't see what he was pointing at, finally I saw a beautiful Mourning Cloak butterfly resting in the leaves. They are quite shy creatures, so I was surprised to be able to get so close to it. After hiking up and up and up over several boulder fields such as the one on the right, we finally made it to the rim of the gorge. The trail has lots of white trail blazes painted on the trees , but at the top some were painted on the bare rock. 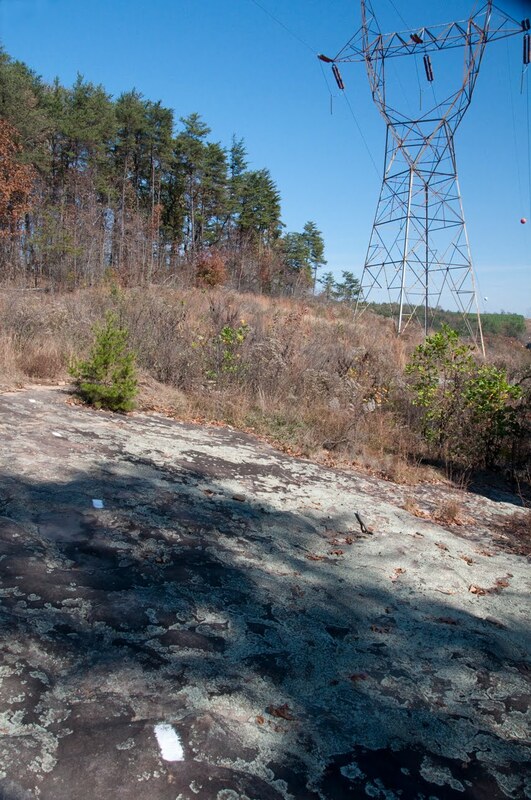 Just past the powerlines, we were rewarded with a fabulous view of where we had hiked. I've drawn a rough sketch of the trail in red. From here, we still had about another 1/2-mile to go to reach Snow Falls. This area was once owned by the Bowater Paper company. The upper parts had been logged, the more inaccessable sides of the gorge had not. It was obvious that we were walki ng in a younger, second-growth forest up on top. 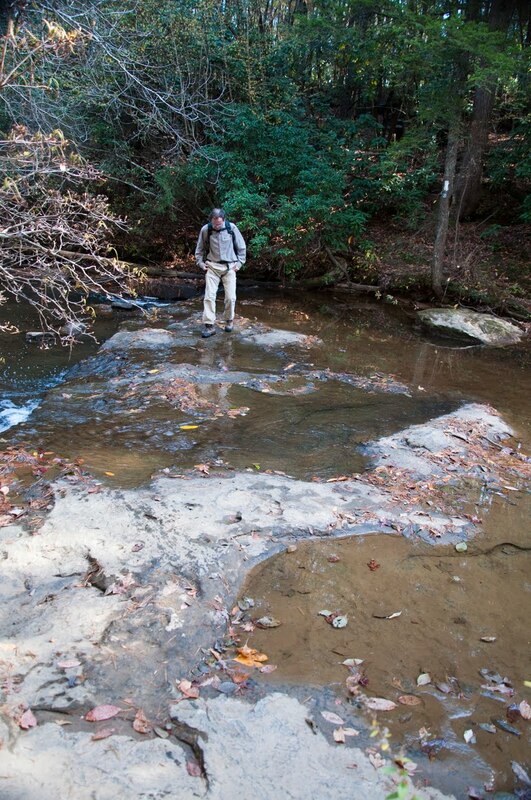 After crossing a dirt road that led to a clearcut area, the trail came to another creek. Fortun ately, the water was low enough that we could easily walk across it. Finally, the trail started losing elevation and we could hear falling water, we knew we were getting close to Snow Falls! We could not find a trail to go to the bottom of the falls, so we had to stay at the top. I hung on to a tree to get out far enough to take this photo! After a picnic lunch, we packed up and hiked the 3 miles back to the car. It was a strenuous hike, but we were glad we did it!